Ironhorse The New Boy will line up on Saturday at Sandown for the 73rd and final time for his connections and trainer Danny O'Brien. O'Brien said the nine-year-old had not lost the zest for the contest and racing, but that connections had decided it was time to retire the son of Rock of Gibraltar while he was still competitive. "He has been a beauty. Every season since he was two he has turned up, and won, and he has given all of us a wonderful ride," trainer Danny O'Brien said. The New Boy has won eight of his 72 starts for $549,355 in career prizemoney so far. "He has won three times at Flemington, he has won at Caulfield, and also in front of his owners in their home town of Adelaide. 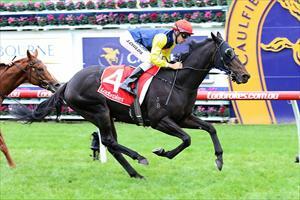 He also won the St Pat's Day and Ballan Cups at Geelong in the past two seasons," O'Brien said. Amazingly The New Boy has placed 20 times in his career, 19 of which have come on metropolitan tracks. "He was stakes placed as a two-year-old in the Blue Sapphire and as a three-year-old in the Adelaide Guineas, so to be still going strong at nine is a credit to the resilience of the horse." O'Brien said what made the horse a stable favourite was his attitude. "He is such a beautifully-natured horse that is easy to do anything with. "We are hoping for the fairy tale finish on Saturday, but whatever happens it's just great chance for all the owners to travel across from Adelaide one last time and enjoy a day at the races and celebrate what has been a sensational ride that he has given us all." O'Brien said The New Boy would have a nice break following his final race before re-entering the stable as a pony to teach the ropes, and hopefully winning ways, to the next batch of stable stars. "He has a home with us for life. He will head out to the paddock with fellow retirees Vigor and Eraset, before he starts his new career as the stable pony."